Homemade boilies have become a well-known bait in South Africa over the past decade. This has given anglers the opportunity to learn more about carp nutrition, giving them the edge to improve their catch rate and personal bests. Over the past few years I have not only played with new boilie recipes, but also with method mix recipes and the success I have had speaks for itself. My idea for it took shape by adding homemade boilie ingredients to the ‘mieliebom’ (a well-known product in South Africa to attract carp) and over time the method mix has continued to progress and improve. The idea of the homemade method mix is for it to have the same nutritional ingredients as your homemade boilies – applying this to your feeding strategy will give you an edge compared to using only boilies. The method mix will leak the smell or nutrients the carp desire, drawing them to the baited area much faster. The smaller particles and powder will settle down and seep into the lakebed, making it harder for the fish to finish all the bait. This keeps them busy and in your swim for longer. Another big advantage of the method mix, in my opinion, is that it can be used even when fishing with particles. The result will be the same and give carp the nutrition they need, that particles cannot deliver on their own. Lamlac: This product is a milk replacement for lambs. It is high in vitamins and minerals and contains whey protein concentrate with a protein level of 50 percent. The product smells and tastes amazing. Whey protein concentrate: Manufactured for bodybuilding and animal nutrition feed, it contains 80 percent protein. Egg albumin: This is egg white powder, and contains a protein level of 80 percent and a good amino acid profile. Soya isolate: Contains 80 percent protein and a good amino acid profile with the added advantage of being much cheaper than whey protein and egg albumin. 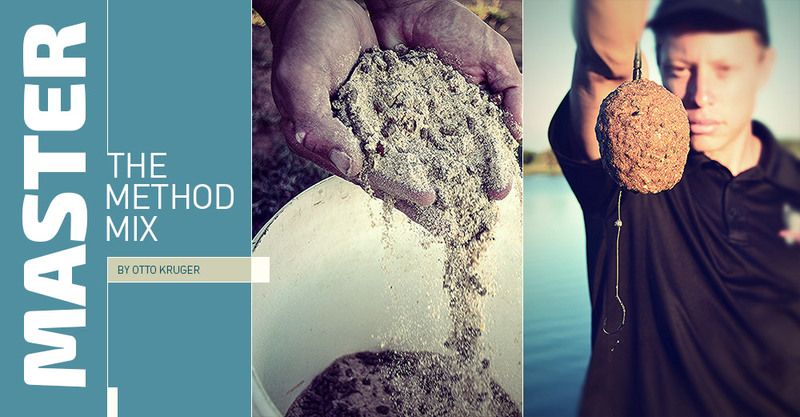 Fishmeal: This is one of the best ingredients to use and will attract carp in any lake. Contains 70 percent protein and an excellent amino acid profile. Egg food: Used to feed small birds, it is high in vitamins and minerals, contains 20 percent protein, helps to bind the mix and smells great. Spirulina powder: This fine green powder is produced from microscopic algae. It contains 65.5 percent protein and smells and tastes like algae, which carp love. A small amount of spirulina powder can go a long way as only two percent is needed. Kelp: This powder produced from seaweed is rich in minerals and important trace elements. Kelp has a strong seaweed smell, which carp love (only a small amount is needed). Brewer’s yeast: Contains many nutrients, amino acids and has a protein level of 42 percent. The product smells and tastes like marmite. Trout pellets: Contains a high level fish meal and can be used alone. Once in the water, the pellets break down after a few minutes which helps to hold the fish in the baited area. A completed method mix should consist of 40 percent binding ingredients (Morvite and ProNutro) and 60 percent additives. Add the amount of method mix you will need to an empty bucket and add water until you find the right consistency – this will depend on whether you want to cast or use an inflatable. At this stage, wet ingredients can also be added, for example: tuna, minamino, hempseed oil flavour, etc. When I’m using an inflatable I like to make the mix dripping wet or sloppy to create a cloud of feed. The list of potential additives and ingredients is endless, limited only by your imagination. You can’t expect better results than others when using the same techniques. Being different is the only way to become a better angler and making your own bait is one aspect of being different, giving you a definite advantage.